This year’s unusually wet winter has been a curse in many parts of the United States, but not in California. After years of drought, California’s usually lifeless and arid-looking desert has been magically transformed into a stunning landscape of colorful wildflowers. 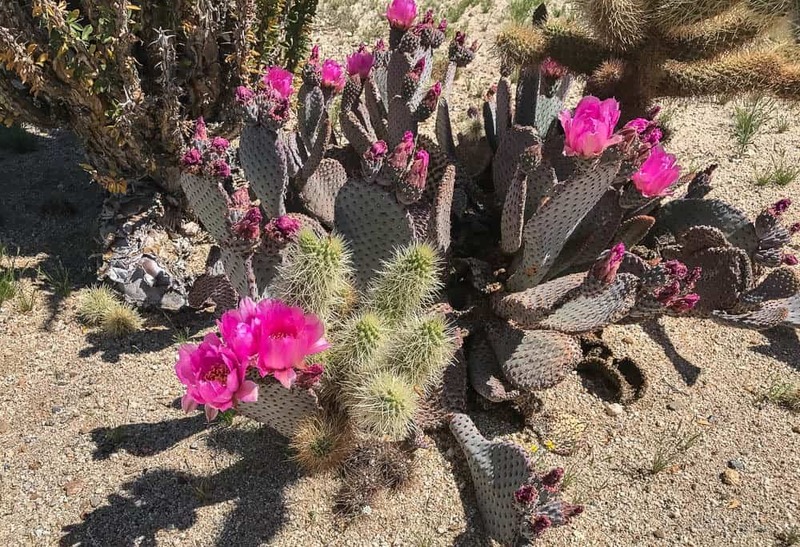 This extraordinary California desert ‘super bloom’ is something quite rare in this barren area. Most of the time, California doesn’t get enough rain, so desert blooms are usually small or inexistent. But this year the desert looks like it has been painted with with color. There is yellow, purple, red, blue and even green in the brown desert. 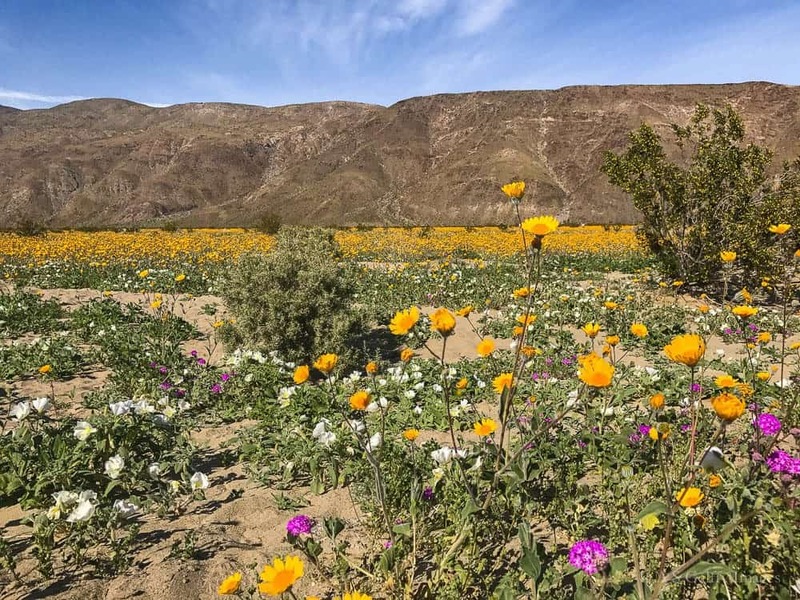 The colorful array of wildflowers popping up in Anza-Borrego Desert State Park makes the area look more like a big garden than a desert. According to the park officials, it’s the biggest bloom they have seen in 20 years! Joshua Tree National Park got its fare share of beauty too this spring. There are flowers everywhere: dune primrose, beavertail cactus, sand verbena, chuparosa, mariposa lily and wild Canterbury bells. Even the Joshua tree is in bloom, a rare and spectacular event that doesn’t happen every year. What is even more interesting about this phenomenon is that it’s synchronized. The bloom happens in the same year, at about the same time throughout the desert areas. 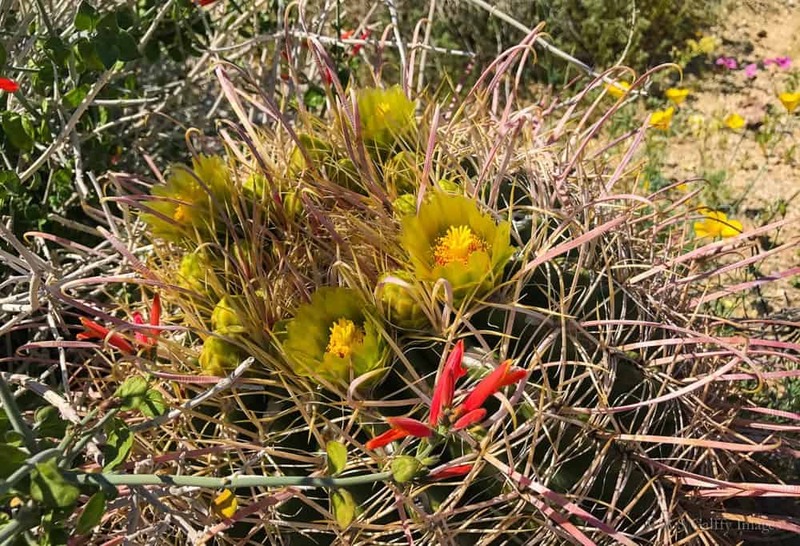 The ocotillo and beavertail cactus are beginning to bloom too. 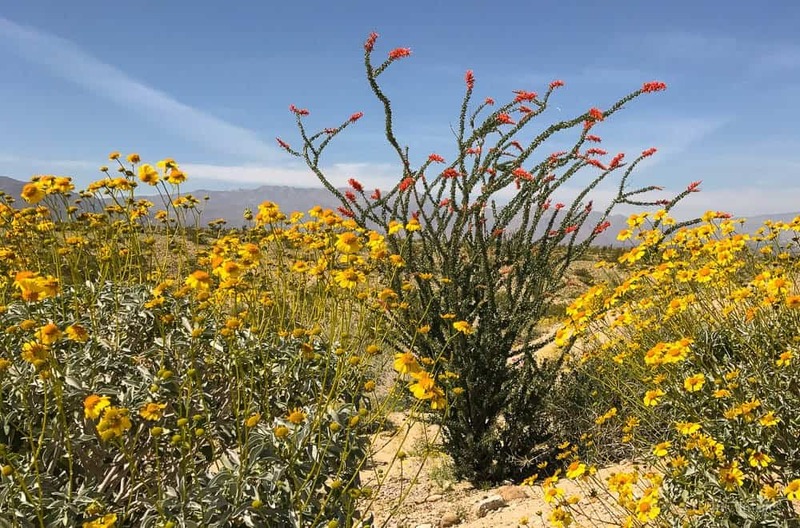 With such a display of beauty, there is no surprise that people are flocking to see the colors covering the hills and valleys of the California desert. Visitors are coming from as far as Europe, Africa and Asia. 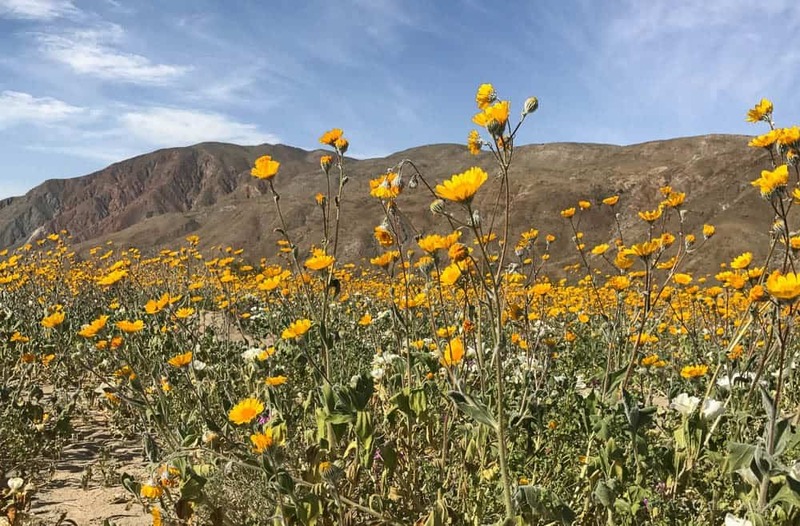 This super bloom is so rare and so special, that looky-loos seem to forget about the torrid temperatures in the desert and sometimes end up fainting from dehydration. If you want to see the desert super bloom in person, you still have time to go. With rain in the forecast this week, the bloom will most likely last till mid April this year. The best time to visit the desert is either early in the morning or late in the afternoon, just before the sun sets. Evenings are particularly beautiful in the desert. When the evening breeze starts blowing, the temperature gets cooler and the sweet smell of wild flowers begins filling up the air. During the day time temperatures in the desert may raise up to 92ºF, making it hard to appreciate the scenery. Springtime is the best season to enjoy the short lived beauty of the desert. Anda, I've avoided looking at this post until now, when the bloom should be over. That may seem strange, but I knew that your beautiful pictures would make me want to head out there and it just didn't fit into my life this year! I'm so glad you got such lovely pictures though. It's nice to see how lovely the year was. Thank you, Cindy. Coming from such a good photographer as you, this is quite a compliment. The desert was beautiful indeed this year. Stunning pictures, Anda! This place is so picturesque! Having grown up in the area, I love the desert anytime. But when the desert blooms, wow! Nothing prettier in the world to my eyes. Thanks for sharing the beauty of the desert that many never see. -Rob. Wow! What a wonderful period of the year. What stunning colours! I would like to see it with my own eyes. Great post and very beautiful photos. California is gorgeous in spring. You can imagine the rest of it if even the desert looks so colorful. Ohh my my! This California desert looks fabulous. I have never been thought such an amazing thing in desert. Photos have turned up amazing. I truly enjoyed reading. Thanks. Thank you, Vidya, I appreciate it. Wow, your photos are amazing - so colorful. I really love wildflowers but unfortunately don't think I can make it out there to see it for myself. Maybe one of these years! Hope you'll make it to California during the spring bloom. Wow, nice to see some more wildflowers than normal. California was in a drought all of the 5+ years I lived there! Beautiful captures! Also great to see your blog back online! I wish I was home this year to see the blooms! I have never seen them before! Hope next year it's also the same! Stunning photos, as usual! I live too far away to just run up for a weekend but maybe someday I can plan ahead when I know there's been an incredible amount of rain and finally see a superbloom. Yea, you are right Jill. I agree that this rare desert bloom is something you can't really plan on seeing. Your pics are so beautiful :) How long so you think that it can stay like this? I am asking because we will be there in May. May is way too hot it the desert for these flowers to resist. They predicted the bloom may last till mid April this year. I'm so glad you got to visit and see the super bloom too. We really loved seeing all the flowers. We'd love to see the flowers at Joshua Tree. What a great collection you have here. Anza Borrego was so beautiful, but it was way too hot last week when we went there. Hopefully you had cooler temperatures. Spectacular. I've neve seen so many flowers in a desert. I've been in the Nevada high desert, around Joshua tree, and through most of the southwest and never saw anything even close to these blooms. This year's bloom was absolutely unique, Rhonda.